Dr. Shanel Bhagwandin saw the steady flow of patients who traveled from Southeast Florida to New York’s renowned Mount Sinai Hospital for the specialized treatment of peritoneal mesothelioma cancer. He knew there was a better way, and he just made it happen. Bhagwandin made the 1,200-mile move himself — from Mount Sinai to the Jupiter Medical Center — to start the latest surgical oncology program that specializes in cytoreductive surgery and hyperthermic intraperitoneal chemotherapy (HIPEC). 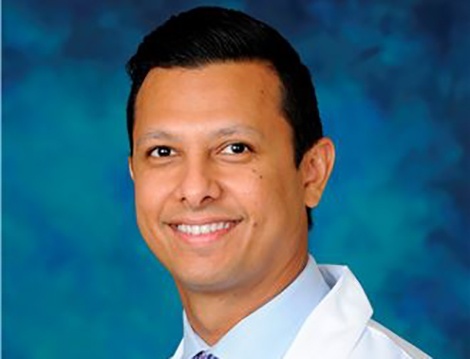 Bhagwandin, who grew up in South Florida, has spent considerable time at the Jupiter Medical Center raising awareness of his program with patients and medical professionals. The cytoreduction and HIPEC combination has become a key strategy in treating a variety of abdominal malignancies. Its effectiveness has allowed peritoneal mesothelioma patients to survive considerably longer than ever before. Many today are living five to 10 years and beyond, which was unheard of a decade ago. According to one study involving more than 100 patients at the Columbia University Medical Center, the median overall survival rate was 6.65 years. And 30 percent of the patients had a survival estimate of more than 10 years. An earlier, larger study produced an overall median survival of 53 months for those who underwent the cytoreduction and HIPEC combination. By comparison, patients who receive only systemic chemotherapy — which is the majority of patients with peritoneal mesothelioma — typically survive less than two years. Many patients, and even oncologists, approach mesothelioma with a hopeless view. And in the majority of cancer centers around the country, the cytoreduction and HIPEC combination is not even available. Although the physical distance between the two facilities is vast, the Jupiter Medical Center is part of the Mount Sinai Health Network, allowing for a variety of shared resources, including clinical trials. Even in Jupiter, Bhagwandin remains the medical director of surgical oncology network development at Mount Sinai. He also is an assistant professor in the Department of Surgery at the Icahn School of Medicine at Mount Sinai. He participates regularly in a national HIPEC tumor board meeting, which allows oncologists around the country to freely discuss cases and treatment ideas. Cytoreductive surgery, which is still evolving, is a complex procedure that can last up to 10 hours. It includes meticulously removing all visible tumor cells throughout the abdominal cavity. It may involve removing parts of various organs, including the liver, intestines, stomach and spleen. HIPEC immediately follows the cytoreduction. It involves a heated chemotherapy solution that is pumped directly into the abdominal cavity, where it is circulated for up to 90 minutes before it is drained. The idea of HIPEC is that by delivering high-dose chemotherapy directly to the abdomen cavity, it will kill any microscopic tumor cells left behind after surgery, something that systemic chemotherapy can’t do. Bhagwandin has five cytoreductive surgery and HIPEC combination procedures scheduled for May, a clear sign that his move to Jupiter was needed.